A few weeks ago Matt mentioned that he thought bone-in chicken on the grill sounded so good. I've never even attempted to try it so figured I should give it a whirl. Spoiler alert... nailed it. 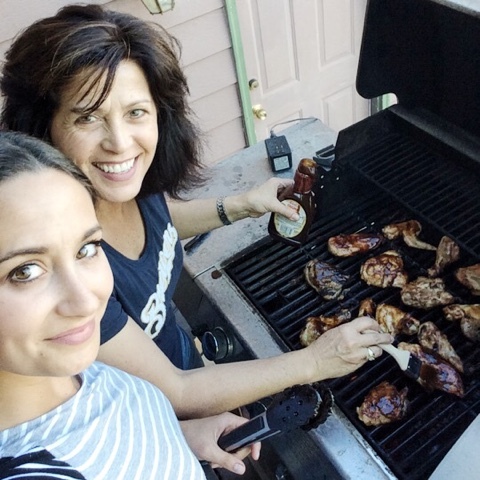 Because we were new to this BBQing bone-in chicken, we decided to turn to the experts of Pinterest. ;) I found this post super helpful. Turns out that there is a science to grilling bone-in chicken. I would have definitely done that wrong! Phew! The chicken takes about 40 minutes to grill & 2 minutes to inhale. We seriously could not have cooked it better. Not to toot my own horn, but toot toot. Let me know if you give this a try? Much easier than I thought & tastier, too! Plus, it's the perfect thing to try at your Memorial Day BBQ! Happy Wednesday! !